Yesterday's Straits Times (14 Nov) carried a report of a local man suing Sentosa Development Corporation for compensation and losses suffered after he stepped on a stonefish while wading in waist-high waters at Tanjung Beach, Sentosa Island in February. The venomous stings gave him a rare permanent pain condition (reflex sympathetic dystrophy) that cost him his job and racked up a sizable medical bill. He did not see a poorly placed signboard warning bathers to 'beware of uninvited guests' (like stonefish and jellyfish) and did not wear shoes because "everybody goes barefoot" on Sentosa's clean, well-maintained, man-made beaches. While I symphatise with him (stonefish stings are terribly painful), I found it amusing that he is suing Sentosa for this mishap. It's like suing Terengganu state or tourism departments when you get stung by a jellyfish while swimming in Redang, or when you step on a stingray at Sharkbay and get stung. Come on, it's not like Sentosa deliberately placed stonefish, stingrays and other reef creatures around their man-made beaches to make them more natural. Though the beach is man-made, the sea water is natural and there are no barriers preventing marine life from coming near the shore. Next thing you know, someone will be suing the Parks and Recreation department for getting bitten by a centipede at a campsite! Do not touch or handle reef creatures. Be content with just observing them. Shuffle your feet when walking in shallow water. This will alert creatures hiding on the seabed to retreat away so you don't step on them accidentally. Wear clothing to avoid getting stung or scratched. Stinging coral or jellyfish can only sting exposed areas of your body. If you bump against sharp coral, clothing will help minimize cuts and injuries. Look carefully where you are going. Some transparent jellyfish may be hard to see and that innocent rock or coral you bump into might be some reef creature in disguise. Maintain good buoyancy control at all times while skin-diving, snorkelling or diving. Wearing a life-jacket when snorkelling helps you to stay buoyant and avoid contact with anything on the seabed, corals or rocks. This site has moved completely to its new home at Dreamhost and seems to be running normally. Using some of the goodies offered by Dreamhost, expect to see a brand new Redang Forum up soon. Just received news from a recent guest at Berjaya that the Berjaya resorts which usually remain open throughout the monsoon will be closing from end Oct to February next year. This means that ALL resorts on Redang will be closed this monsoon season, so visitors planning to visit should make alternative plans. Thanks to Brian S. from UK for this tip! With many visitors staying away due to the rainy season, it probably doesn't make good economic sense to remain open throughout the monsoon months, which is why all other resorts usually close by end Oct and reopen from mid-February the following year. For those who can't wait till February, there are islands off the west coast of Malaysia like Pangkor and Langkawi which are not affected by the northeast monsoon though divers are limited mainly to diving at Pulau Payar Marine Park (situated between Penang and Langkawi) unless they intend to venture to other dive sites further overseas. For those of you planning your 2006 vacation to Redang, I have posted the 2006 public and school holiday schedules for Malaysia and Singapore. Over the next week or so, I will be moving this website to a new webhost. The transition should be fairly smooth but just in case there are any glitches or	delays in DNS propagation, I apologize if you are temporarily unable to access this website. Anyway, with web traffic down due to end of season, it's probably the best time to move. For those of you interested, I'm moving over to the folks at Dreamhost who have been generously hosting this site's guestbook for free the last 5 years. They are currently offering a fantastic hosting package for just US$7.95 a month with 4.8GB of disk space (compared to my paltry 60MB on my current webhost) and 120GB monthly bandwidth with unlimited domains if you prepay for 2 years. The best part is the disk storage increases each week by 40MB while the bandwidth increases each week by 1GB. The price includes 1 free domain registration. Hosting with them also means that I get to remove the ad-banner from	my guestbook (yay!). Just came back from a 4D/3N annual family vacation at Redang, my last trip to this island for the year before monsoon season kicks in. Taking advantage of the 1-week Singapore school holidays to visit, we were quite surprised to see that it wasn't crowded as we had expected. With another 6-8 weeks before most resorts close for the season, this was the last school holiday for families to visit. We had fine weather throughout though the sea was rougher than usual for this time of year, with big waves hitting Pasir Panjang each evening we were there, which was great fun for the kids and many other guests playing in the waves. Read more about it in our Trip Diary Sep'05. Ayu Mayang Resort had closed early for the year to carry out renovation activities that include adding more rooms to the resort. Looks like Redang Bahtera will open in 2006. Desagreen is making progress in its development but may not make the 2006 season. There's still no DIGI mobile signal on the eastern part of the island where Pasir Panjang and Teluk Kalong is located. Can't confirm this but was told that MAXIS users have similar problems over at Berjaya. During this trip, someone asked me why I ran this non-profit website. Since I had never fully explained this here, I thought it would be a good idea to share my answer to this question with all of you. This website was set up primarily out of concern for the marine environment in Redang. When it was first launched in 1998, soon after my first trip to Redang, it was apparent that such a beautiful place would not remain a well-guarded secret for long. Compared to all the other islands in Peninsular Malaysia, Redang had so much more to offer visitors - beautiful coral reefs just off the beach boasting diverse species of marine life in crystal clear waters. Existing resorts then would be promoting the island and once word got around, it would be impossible to prevent rapid commercialization and development. For example, when the movie 'Summer Holiday' was launched, Redang became an overnight sensation and many started searching for Redang on the internet. 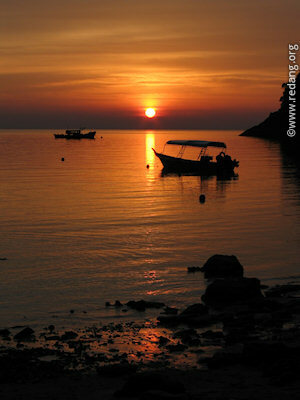 That movie did for Redang what 'South Pacific' did for Tioman - elevated it into the international spotlight. My goal was simple: create the best possible website on Redang in order to attract as many visitors searching for Redang information on the internet in the hope of educating them about marine conservation and how to be responsible visitors. If it was impossible to slow down development, making visitors more conscious about the fragility of the marine environment could perhaps help to minimize the damage. In setting up and maintaining this site, the niggling question was whether it was helping to promote the island even more, thus increasing the number of visitors and accelerating development on the island and destruction of the marine environment. I convinced myself that even without this site, Redang sold and promoted itself by virtue of its own charm and natural beauty. Furthermore, with the help of resorts, travel agents, media and word of mouth, rapid development was inevitable. Many of these forces at work focus on business and economic profit with few promoting conservation education and protection of the coral reefs and marine life. Just take a look at the websites of many resorts and travel agents - many use the marine attractions to sell the island but few seek to educate their customers about conservation. Though some resorts do brief their guests upon arrival about park rules and regulations, many guests ignore and do not pay attention to these briefings. Rules by themselves, and simply communicating them, do not change our hearts. Many follow rules only under threat of fines or punishment and in the absence of enforcement, break them. It is only when we truly understand and appreciate the motivation and reasons behind the rules - what we are protecting and why we must protect - that the spirit behind the rules becomes alive in us. Only our appreciation, love and care for the marine environment can change our attitudes and our actions towards it. Thus the primary focus of this site: to educate visitors about the importance of marine conservation, to help them appreciate the beauty above and beneath the sea, and to promote and encourage its protection and preservation by being responsible visitors. rules for responsible visitor behaviour. By gazetting Redang as a marine park, the governing authorities have addressed the destructive practices of sport and commercial fishing, anchoring of boats on reefs and collection of coral and marine life for sale and trade. What is less clear on Redang is whether as much attention has been paid to regulate land utilization and development in line with sustainable eco-tourism, to develop thorough environmentally-friendly operating procedures for resorts and to regularly audit them, and how to rope in resorts, travel agents and conservation groups as partners in proactive conservation education among visitors. As always, the key question is leadership and enforcement. Even the best strategies, regulations and processes fail to deliver results without clear and proper leadership, enforcement and execution. The greatest impact will always be felt by the housereefs and marine life around developed areas and areas frequented by visitors. It may be true that even when the housereefs and nearby corals are gone that there will still be people who visit the island. Many islands like Langkawi, Pangkor and Tioman continue to attract visitors who may not care for what's under the water and are content to enjoy the resort, the scenery, the beach and the occasional dip in the water. Divers may still visit as the coral reefs in dive sites are less likely to be damaged being less accessible to the masses. But Redang would have lost its shining star - the ability for visitors to just jump in from the beach and be immediately immersed in an underwater world of vibrant colour, beauty and diversity of life. Over the last 7 years that we have visited Redang, we have witnessed the disappearance of much of the housereefs around developed areas in various parts of Redang. First time visitors today will never know what they missed but many of us who have had the privilege to experience it in the past will know we have lost much of our underwater heritage. And when all that is gone, perhaps it is time for this website to be laid to rest too. Came back about 3 weeks ago from a back-to-back 4D/3N Redang and 4D/3N Tenggol dive trip. We returned to Tenggol Aqua Resort which now boasts a very good dive centre but the resort itself is showing its age and needs better maintenance. Next door, a new resort called Tenggol Island Beach Resort had replaced the old Aimers resort. With 7 fan-only rooms currently, it will have air-con rooms and other comforts by next year. This time at Tenggol, we had calm waters throughout our stay contrasted with the rough waters during the last trip. There were plenty of beautiful soft corals in pristine condition but fewer species of nudibranch than last time. 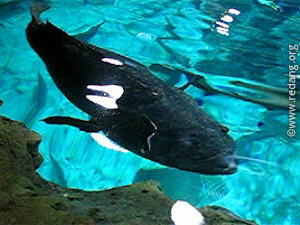 Also absent were the larger pelagic fishes and strong currents which Tenggol is famous for. Probably just wrong timing! What I missed underwater was compensated for on land by one of the most beautiful sunsets I'd seen in recent times. For more details, read the latest Redang and Tenggol trip reports in the Diary section - some pictures from these trips are also available in the expanded Gallery section. There's a rather long and unsightly wooden jetty at Tanjung Tengah near Redang Bay resort. I hope this is just a temporary makeshift jetty as it spoils the beautiful scenery along that part of northern Pasir Panjang somewhat. Laguna has opened 10 new 'standard' rooms at the block behind the dive centre near their jetty. Each room accommodates 3 and is more basic and affordable compared to their deluxe, pool and seaview rooms. It's convenient for divers as it's next to the dive centre and also offers lots of quiet and privacy as it's away from the main beach at Pasir Panjang. The new resort at Teluk Bakau known as Redang Bahtera is not opened yet. The other new resort under construction between Holiday and Coral is known as Desagreen Redang Beach Resort and will comprise 26 single and double-storey chalets, pool and spa. Redang Holiday now has a disco/entertainment deck where it's old dining hall used to be - the dining hall has moved and there are some new 2-storey terrace room blocks to complement their beautiful villas. Paid a visit to Wisana Redang Beach Resort. If peace, privacy and quiet are high on your priority list, look no further. Wisana is the only resort on its own lovely stretch of beach at Teluk Kalong with no noisy discos or karaokes. Just the sounds of nature and waves crashing on the beach. It's a small, 'back-to-nature' resort so don't expect much in terms of creature comforts. Also discovered Mozana Redang Resort, a small budget resort with 24 rooms in a wooden terrace block and semi-D chalets. It is located next to Redang Kalong and apparently has been in operation the last 3-4 years. Meanwhile, Redang Inn at Kalong beach has closed down. Nazir Zaman, sales manager for Redang Campsites and Chalet has written to say they now offer 15 air-con rooms in a seaview-facing chalet in addition to normal tent accommodation. Other facilities include a dive centre, TV/karaoke hall, indoor and beach games. Check out their website. For those travelling from Singapore/JB to KT, Kuala Besut (Perhentian), Merang, Marang and Kenyir Lake, Ping Anchorage now offers new 38-seater coaches and 27-seater VIP coaches for charter. At RM1099 per-way from JB Second Link and RM1399 per way to Singapore, these prices are valid till Oct 2005 when purchased with a tour package. Check out their website for terms and conditions. If you have a large group, this works out to <S$50 return with the added convenience of direct drop-off & pick-up at Merang jetty, saving time. A few months back, I mentioned NASA's Worldwind software for exploring the earth using detailed satellite imagery. There are some additional satellite image data packs available from www.worldwinddata.com. As you can see in	this completely updated website, all maps are now pretty accurately rendered thanks to Worldwind. Google has also released a similar software called Google Earth. June school holidays have ended for both Singapore and Malaysia. For the third year in a row, we've given our June Redang trip a miss. Probably a good thing too as we hear from friends who've been there that it appears there are more people than fishes, at least at the Marine Park Centre! :) With both our kids in secondary school, holidays aren't what they used to be as there are still school co-curricular activities and training sessions to attend, leaving us with a short window of just over a week for us to get away. Other than our usual June KL trip to visit family folks, we headed for Cameron Highlands which we had not visited for quite a long while, trading sun, sand and sea for cool mountain air, trekking and tea-plantations instead. It's a	change to play with plated jungle millipedes and pitcher plants instead of clownfish and anemone. The new road from	Simpang Pulai also made it a less nauseating drive to the top but lengthened the journey by about 45 minutes for those heading up from the south. Coming back by the Tapah way, it was good to see the old road widened around most bends. Like Redang in June, Camerons was crowded too with heavy traffic at Brinchang and Tanah Rata. Though not as cool as a decade ago, it was still nice with temperatures hovering in the low-to-mid 20's. If all goes well, I'll be returning to Tenggol next week from 8-11 July on a dive trip with my cousin - last time we dived together was at Mabul & Sipadan 2 years back. Will probably	stop by at Redang before that for a few days to pick up some dive gear I accidentally left behind during my last trip in April. Stay tuned for more updates on Redang and Tenggol! Finally, after months of waiting to hear news about Wisana resort, I finally managed to get in touch with Khairil Anwar,	dive instructor at Redang Dive Centre at Wisana Redang Beach Resort. He says their website is under construction and	should be up by middle of the year. Wisana resort comprises 4 bungalows (twin/triple sharing) and 1 longhouse with 5 quad sharing rooms and is able to take up to 40 guests maximum. All rooms are air-conditioned with attached bathroom. Snorkelling & diving facilities are	available while jungle trekking is available upon request. As the only resort on their little stretch of beach at Teluk Kalong Kecil, they offer guests total privacy and quiet with no karaoke or disco. A 3D/2N snorkelling package costs RM310 (quad sharing) and RM350 (twin sharing) while an additional night cost RM80 (all prices quoted per person). I have updated the Resorts section with all known resorts now listed and with 2005 prices for 3D/2N packages (except for Redang Holiday as I do not have their pricing information). Have also updated the speedboat departure schedules in the Transport section. A Sitemap link of this site has also been added to each page's menu bar to provide an overview of this entire site. Had a good driving and diving trip last weekend to Redang. Driving from Singapore to KT and back was a good experience though it was a rather long journey (11 hours there and 9 hours back). Stayed at Laguna resort and did a total of 6 dives over 4D/3N. Also went on a round-island cruise where I got to see the rocky western coast for the first time. We had 2 days of perfect weather and scattered showers the next 2 including a storm one evening. Redang wasn't as crowded as expected. Business at most resorts in Redang had decreased compared to the same period a year ago. With memories of last year's tsunami still fresh in people's minds and the jitters about recent earthquakes in	Sumatera, Indonesia, potential visitors may simply be avoiding islands and beach resorts in the region. These fears are unfounded as Redang is located in the South China Sea off the eastern coast of Malaysia and is unaffected by seismic activity in the Indian Ocean off the western coast of Sumatera, Indonesia. So Redang remains a safe place to visit. Diving visibility was good which kept me busy with my Canon A95 (took over 300 shots in all). Also observed 'blue sand' -	bioluminescent ostracods (tiny crustaceans) - at the corner of Pasir Panjang beach near the walkway to Redang Reef and at Reef's front beach. There's some work at Merang river mouth to deepen the waterway there, making it easier for boats to go through even during low tide. 2 new resorts are under construction, one located in the forest between Teluk Kalong and Teluk Bakau which looks like it might be opening quite soon, and the other at northern Pasir Panjang between Coral and Holiday which is still in its early stages. New accommodation blocks at Berjaya Beach are still under construction. These are located on the hillside to the west away from the main resort buildings. Laguna is building a new block behind their dive centre that will provide 10 rooms upstairs (mainly for divers) as well as a departure hall downstairs for	guests and a marine science lab for KUSTEM staff and students to use. Redang Inn resort was deserted and did not look like it was open for business. A CELCOM/TMTOUCH mobile phone cell station has been activated at Laguna Resort so the signal is very strong for users of these services at Pasir Panjang/Kalong. Some coaches (Enjoy, Konsortium, 5-Stars) drop-off and pick-up passengers at Merang jetty which make it more convenient for passengers going to Redang. Check with your coach operator. Berjaya air Sgp-Redang flights will commence on 28 April with 3D/2N promotional rates (RM150 discount) valid for April/May 2005. Check their website. An 8.2 magnitude earthquake just struck off the Sumatran coast close to the epicentre of last December's 9.0 quake. It certainly was a strong one as I could feel my 19th floor apartment here in Singapore sway slightly just past midnight an hour ago. I hope it doesn't trigger another catastrophe in the region. The wait is finally over for travellers wishing to fly between Singapore and Redang. Berjaya Air has put up info on the new route on its website. As expected, it doesn't come cheap at S$149 one-way and S$298 return (children pay half price) but it sure beats the	10 hour coach journey. Flights depart daily from Seletar airport at 1135h, arriving Redang 1300h, while the return flight leaves Redang at 0950h, arriving Seletar at 1115h. For those who can afford it, I'm sure the aerial view of Redang will be quite a spectacular sight! For the rest of us who can only afford a coach, Transnasional has some new contact numbers for its KenAir Transnasional office at Suntec City Mall (tel: +65-68289000). The old url ('www.kenair.com.sg') does not seem to be valid anymore, so use Transnasional's Malaysian website for more information. I'm not sure if their Singapore phone booking service (+65-63969071/63415083) is still available. All this information has been updated in the Transport section. If all goes well, I'll be making a dive trip to Redang this weekend 1-4 April and I'll try to get more updates while I'm there. So stay tuned and if you're visiting, remember to take good care of the marine environment there. If you're a first-time visitor, please read the Park regulations & Conservation section before you go. THANK YOU FOR BEING A RESPONSIBLE VISITOR! 2005 visiting season is finally here with all resorts open for business with many offering special promotional rates for the month of March. With the extremely hot weather setting off small bush fires in Malaysia and Singapore over the last month, visiting Redang seems like a good way to cool off and escape the smoke-scented air. Hopefully the dry-weather spell which led to low water levels in reservoirs on the mainland didn't affect Redang too badly as many resorts still get their water from the ground. Berjaya Air has announced direct Singapore to Redang flights beginning April 2005. For many who can't stand the long coach journey, flying to Redang will be a welcome alternative. Don't expect it to come cheap though. In these days of keen competition among Asia's budget airlines where flights to overseas destinations like Phuket, Bangkok, Bali and Hong Kong can be had as low as RM29.99 or S$28, Berjaya's prices would come across as rather pricey. But then no one else flies to Redang and Tioman except Berjaya Air and with only 48-seater DASH aircraft, perhaps it's better that 'not everyone can fly' since there won't be enough seats then! There was an article in today's papers (NST 9 Mar) about 39 divers rescued after their overloaded boat capsized in rough seas on the way to Pulau Aur from Mersing. Thankfully no one perished and all were saved after some 2 hours adrift in the water. The Malaysian Meteorological Service (MMS) had issued warnings about rough sea conditions and the paper quoted another dive shop owner as saying he had experienced 4m high waves while on the way to Tioman the same day. It's a reminder that the tail-end of the monsoon season which lasts from November to early March still packs a lethal sting. To help those of you planning visits during the monsoon season, I've included links to the MMS Weather warning	pages in the home-page navigation bar above and the Planning & Links sections. Please check before you go. Finally, Redang Reef and Redang Lagoon resorts have launched their own resort web sites. All resort contact information have been updated in the Resorts section. The Links section has also been updated. The last year had been an exciting one for me. As an avid fan of space exploration, I had eagerly followed the progress of Spirit and Opportunity, NASA's twin robot explorers on the surface of Mars. Both are still 'alive' and well more than a year after landing on the red planet and continue to beam back breathtaking pictures of Martian landscapes. Then, Cassini-Huygens arrived at Saturn after a 7-year journey and beamed back never-before seen high-resolution pictures of Saturn, its rings and its moons. Last month, the Huygen's probe which had piggybacked on Cassini landed on the surface of Titan, Saturn's largest moon and the only moon in our solar system known to have an atmosphere, and finally revealed photos of its fascinating landscape strangely similar to our own except it had rivers and oceans of methane instead of water. It was then that it occurred to me I had never seen pictures of Redang taken from space. A quick search on the Internet revealed a software gem in the form of NASA's WorldWind software which allows users to explore our Earth like never before - from space - using highly detailed landsat satellite and radar imagery. When installed on a normal PC, WorldWind allows users to view the entire earth, rotate it and zoom in all the way to any part of it with a high level of detail. The photos shown here were captured off the screen using WorldWind and I enhanced them to make the details more visible. The beaches at Pasir Panjang, Teluk Kalong and Teluk Dalam are all easily visible, as are those on Lang Tengah and Perhentian. I even managed to locate the tiny islands of Sipadan and Mabul off Sabah. This software will provide hours and hours of educational fun. You can download the software from the link given above but it is huge (about 170MB) and I'd recommend it only if you have broadband access as it uses .NET technology to interact with NASA's server. I had a great time trying to locate my home in Singapore as well as my parent's home in Ampang, KL - the North-South highway is clearly visible as are major roads in the cities. If it gets any better than this, next time you're sunbathing on a beach in Redang or anywhere else on Earth and looking up at the sky, remember to smile (oh, and keep your clothes on too)! A new visiting season will soon be upon us as all resorts open their doors on 1 March. A few have already begun earlier this week. For those of you visiting the island this year, we wish you an enjoyable and safe trip and please do your part as responsible visitors to protect the marine environment there! Redang, Perhentian and all the other islands located off the east coast of peninsular Malaysia were not affected at all by the tsunami. All hotels and resorts at affected areas in Langkawi and Penang are operating as usual. Peninsular Malaysia is sheltered by the Indonesian island of Sumatra and was thus spared the full impact of the tsunami. The much slower reflected (shadow) waves affected some coastal areas in the northwestern states of Perlis and Kedah as well as some parts of Langkawi and Penang islands, mainly Pantai Cenang and Kuala Teriang in Langkawi, and Miami Beach, Batu Ferringhi and Pantai Pasir Panjang in Penang. Visit the Malaysian tsunami update page for more information. All hotels and resorts in the affected areas are now operating as usual, while tourist attractions are unaffected. According to a Malaysian Star newspaper report, the Pulau Payar marine park, located 19 nautical miles south of Langkawi in the northwestern corner of peninsular Malaysia, was not affected by the tsunami. The waves were much smaller and did not go beyond the beach. Scientists from the London-based Coral Cay Conservation group noted that that corals and marine life did not appear to be damaged or affected and that 'life goes on as normal'. Pulau Payar is the only marine park located off the west coast and is a popular diving and snorkelling area especially when the east coast is experiencing the monsoon season. All the other marine parks including Redang is located off the east coast of peninsular Malaysia. ...faith & perseverance in meeting personal challenges and difficulties. Our hearts & prayers go out to those who have experienced personal loss in the wake of the tsunami catastrophe and our heartfelt thanks to those who are making much effort and personal sacrifices to help the survivors rebuild their lives. Despite the high death toll, it was encouraging to read that coral reefs and mangroves had helped to shield some coastal communities particularly in the Maldives, lessening the energy and effect of the tidal waves upon the shorelines. Without these natural barriers, the casualty figures could have been much higher. Areas where these had been removed or severely damaged in the course of coastal land development received the full force of the deadly tsunamis. Of course, many of these coastal reefs that were buffeted suffered too, although researchers have yet to discover th extent of their damage. That will have to wait as the world focuses, rightly so, on alleviating the human suffering first. With opening season just over a month away, we've put together this 2005 makeover version specially for you with updated information. We hope it has been worth the wait. We were away for almost all of December visiting Joyce's family in Hong Kong and my folks in KL, and were also busy gathering information and putting this site together. There will be quite a lot of long weekends this year with many public holidays falling on Friday or Monday, so plan well ahead of time! Some resorts will open from mid-February. If you can't wait, you can always head for the Berjaya resorts which are open all year round. Last year, we managed to squeeze in a trip to Redang in mid-October again, when most resorts had closed. We had 3 days of fine weather and it rained only on the day we left. Visibility under the water wasn't very good and the sea was a little rougher than usual but that didn't stop us from enjoying the marine life. If you want to avoid the peak season between May and August, October is still a good time to visit as monsoons won't start till November. We had the whole beach (and pool) to ourselves most of the time. The trip also provided ample opportunities to test out the Canon A95 digital camera both on land and underwater in its marine pack. Read about it in our Redang 2004 Trip Diary. Large potato cod at Atoll Reef, Ocean Park, Hong Kong. Whenever we are in Hong Kong visiting Joyce's side of the family, one of the places I look forward to visit is Ocean Park's Atoll Reef and Shark Aquarium. Atoll Reef is a large marine aquarium with 4 viewing levels from the water surface all the way to the bottom. They have an impressive collection of really large groupers, potato cods, trevallys, jacks, eagle rays, marble rays, napolean wrasses, barracudas and many other reef fishes. The largest grouper was nearly couch-sized which would easily dwarf the Redang Marine Park Centre's resident grouper. Their shark aquarium also has a large collection of various species of sharks including the very fearsome looking sand tiger or ragged-tooth shark with its many protruding dagger-like teeth. There were black-tips, white-tips, nurse sharks, leopard sharks, guitarfish, hammerheads, cat sharks, bamboo sharks and so on. We managed to observe the sharks during feeding time and it was quite a sight. Sure, there are better things to do in Hong Kong like eating and shopping, and even Disneyland when it opens later this year, but if you love marine life you certainly won't be disappointed with Atoll Reef! And with JetStar Asia offering return flights from Singapore to Hong Kong now at S$140 (Jet Saver fares excluding airport charges), flying to HK has never been more affordable! That's even cheaper than flying KL-Redang on Berjaya Air, or Singapore-KL! Laguna Redang has opened a recreation block located just behind the More More Tea Gift Shop. This houses the snorkelling & recreation equipment rental area, a food centre and a gym and massage room upstairs. There is also an internet room where you can surf and read your email for RM10 per hour. As with other food & beverage outlets, the food centre and the other paid facilities like the disco/lounge, internet room, massage room and paid recreational activities (archery and canoing) are open to non-guests as well. These are welcome additions to what's already available at other resorts as Pasir Panjang now has more choices of eating places and recreational activities for those who find they need more than just sun, sand and sea. Elsewhere on Redang, Berjaya will open a new accommodation block next year that will add quite a number of rooms to their existing 152. There are also 2 new upcoming resorts. One is going to be developed on the parcel of land between Coral Redang and Redang Holiday and is apparently targeted at upmarket visitors (4 or 5-star) though it is unclear when it will be completed. The other is located between the Laguna jetty and Redang Inn at Kalong beach and is scheduled for opening next year. Even when it appears that all the available beaches have been taken up and that no more resorts can be built, this one comes as a surprise as it doesn't seem to have a beachfront. Oh boy, I hope this doesn't start a new trend of resorts being built inland! House reefs located at popular beaches have safe snorkelling zones marked out with white marker buoys. For your own safety, please observe these safe zones and stay within them. There was a tragic accident earlier last year when a snorkeller died after being hit by a boat. Reports said she had wandered out of the safe zones. Flying to Redang? You can by Berjaya Air from KL Subang Airport right now. News has it that they are also planning a Singapore to Redang service while AirAsia may begin a Senai (Johor Baru) to KT service. Right now, AirAsia flies from Senai to Kota Bharu. If you're staying in Singapore or Johor, that's the fastest way to get to Perhentian and Redang by air since Kuala Besut and Merang is about 50km and 90km respectively from Kota Bharu. It should be quite easy to get a cab to either destination from the airport - be sure to bargain. Divers should probably still hit the road to avoid the 24-hour no-fly (from last dive) rule which should be much faster now with the new ECE (East Coast Expressway) phase 1 completed between KL and Kuantan. 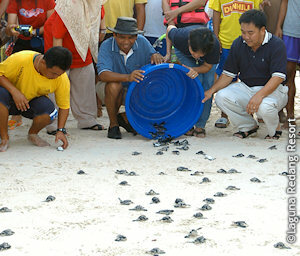 Baby turtles returned to the sea. For those flying Berjaya Air, contact your resort to arrange transfers between the airport (located near Berjaya Spa Resort) and your resort. They will send you by van from the airport to the jetty at the southern end of Redang opposite the Marine Park Centre where you will transfer to a waiting boat that will bring you to the resort. Baby turtles off to a good start! Remember the turtle that laid its eggs on the beach near the Laguna jetty in May last year? Of the 103 eggs 'bought over' by Laguna for natural incubation, 98 successfully hatched and were released back into the sea in early July (see photo). Doesn't sound like a lot considering that research figures show only 1 in 1,000-10,000 hatchlings survive the next 20-30 years to become an adult. Still, every little bit of help we can give them takes these beautiful and endangered creatures one step away from extinction. Let's do what we can to save our turtles!